I seem to be on a quinoa roll lately and I love finding new ways to incorporate this super food into our weekly menus. 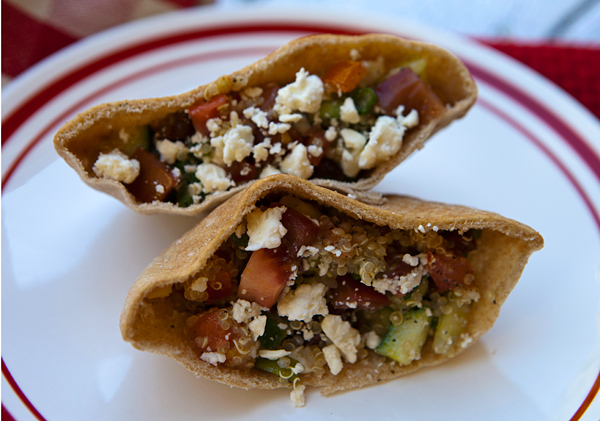 I have started cooking quinoa in bulk and keeping a bowl of it in my refrigerator to use in salads, soups or in other recipes such as these stuffed pita pockets. Adding quinoa to your recipes adds a complete protein containing all the necessary amino acids. It is also a great source of fiber, and a decent source of iron, magnesium, calcium, vitamin A and vitamin E.
I love the flavors of a traditional Greek salad so this recipe was right up my alley and made a great, light, but satisfying lunch. 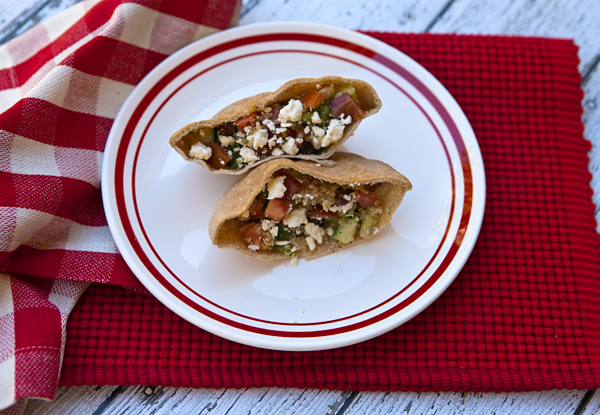 I used small whole wheat pita breads to increase the nutritional value and chose a light feta cheese to reduce fat. To cook quinoa, place 1 cup quinoa with 2 cups water or broth in a pot and bring to a boil. Reduce the heat to a simmer and cook for about 20 minutes or until the quinoa is tender to the bite. Whole grain breads add additional nutritional value to any meal. Place the quinoa, tomatoes, cucumbers, onions, and olives in a bowl and stir to mix. Drizzle the vinegar and oil over the mixture and toss to mix. Cut the pit breads in half, and spoon equal amounts into each pita half and sprinkle the feta crumbles over each pita half.